Actually, Jill and J didn't like this one either, and doing a substandard picture is a rotten thing to do to one of the finest books ever written. In my defence, I used time where I was too exhausted to draw anything else to do this, so it was drawn hastily under bad light late at night. I've also tried to experiment with working in a style other than my usual, because for me that's a big part of what IF is about. By the way, a theme I've suggested is "Alice." :). 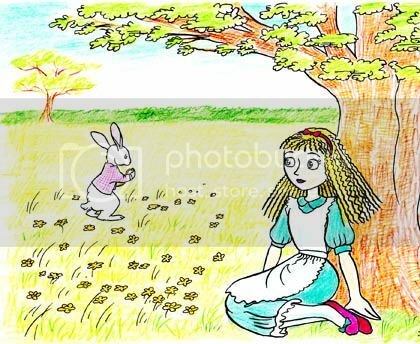 I'd really hoped to get away from Tenniel's or Disney's Alices, but I failed there as well (exacerbated by colouring her dress in a bluetone). What I do like is the white rabbit's front paw, which is drawn like a real rabbit's. Oh well - against my better judgment here's my picture for "Dreams." It's black ink line and coloured pencil. i also like the rabbit's front paw! Well, it's so easy for us to be our harshest critics, but oftentimes, doing something different, out of our comfort zones, actually allows others to catch a glimpse of another side of our skills and sensibilities. Your picture is really lovely - it's balanced with a nice composition, proper perspective, appropriate and pleasing colors. Nicely done Ian. Even the worst drawings have something good in them. The rabbit is excellent, and it's a good thing to go out of where you're comfortable. No one improves as an artist otherwise. I think it's great, though I understand your dissatisfaction...the rabbit is wonderful and I really like the shape of the trees! Even a "bad' illo is good if it's one of yours! This has the look of a sketch that provides a view of how you want to develop the look of your characters. There's definitely something "twitchy" about the rabbit's ears...they look alert and show that he's very preoccupied. Alice has that wide-eyed incredulous look, and I really like the wavy hair. I do find some of these topics kind of greeting card-ish, but maybe it's the broadness that is the biggest challenge. Have you ever submitted a topic? I have twice, but no go. I'd like to illustrate "attitude" or "serendipity." Anyway, thanks for your wonderful feedback. I always appreciate your specific comments, and I would always welcome any suggestions as well. I respect the work you do very much. I'm so busy at work, so I don't have time to look at your new posts...I want to "make the rounds" of my favorite blogs over the weekend.